Roomy Ranch in Meadowbrook Farm! Don't miss the opportunity to own a quality home in a premier Chesterfield neighborhood. The tree-lined drive as you enter the subdivision tells you this is someplace special. This brick front ranch features a huge formal living room with front corner windows for tons of natural light. Formal dining room, hearth room with a brick fireplace and a roomy kitchen have the potential to be a showplace. The master suite has a walk-in closet and an updated bath with a curbless shower. Three additional generous bedrooms and another full bath complete the main floor. Fun times await in the finished lower level with a second kitchen, full bath and huge rec room area. Updated windows throughout. Fenced and irrigated yard. 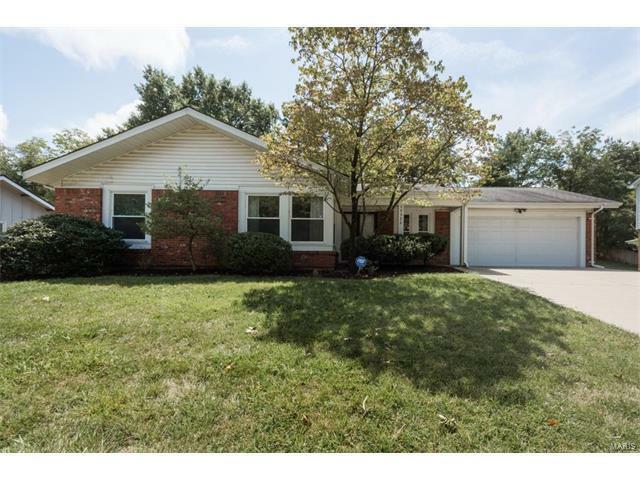 Located in the Parkway West Schools near Meadowbrook Country Club. Lovingly owned by the same people for over 20 years. Now it's your turn. Start making plans today! I-64 to MO 340/Olive Blvd/Clarkson Road exit South to Left on Baxter Road to Right on Country Field Drive to Right on Golden Rain Drive. House is on the left.